Boss Dr Beat DB66 Metronome with AC Adapter. Condition is Used. Shipped with USPS Priority Mail. Boss DB-90 Talking Dr. Beat Metronome. Condition is Used. Shipped with USPS Priority Mail. Trending at $72.14eBay determines this price through a machine learned model of the product's sale prices within the last 90 days. 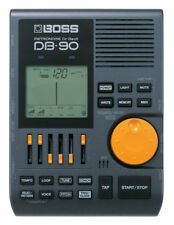 boss db -30 metronome . Condition is Used. Trending at $30.99eBay determines this price through a machine learned model of the product's sale prices within the last 90 days. Boss DB-90 Dr. Beat Metronome. It is new condition with plastic screen cover still on. Battery in it is dead, not sure if it is the original battery or not. If this was ever used, which i doubt it was, then it was probably only used once. Box may have minor imperfections. Manuals are included. Shipped with USPS Priority Mail. Trending at $106.66eBay determines this price through a machine learned model of the product's sale prices within the last 90 days. 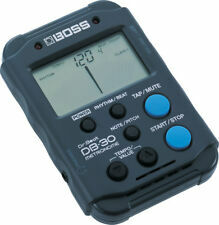 Boss DB-30 Pocket-Size Clip-On Drum Metronome Dr. Beat Electronic TESTED WORKS . Condition is Used. Shipped with USPS First Class Package. The new DB-90 is loaded with quality sounds and drum patterns to make your practice sessions less mundane and more musical. Reference Tone: 10Auto Power Off functionTurns unit off after 60 minIndicatorsLCD Display, Tempo Indicator LED x 2ConnectorsTRIG IN jack. Built small for slip-in-your-case portability, a headphone jack lets you practice anywhere silently. Rhythm styles. Got the beat?. With the DB-30 you will. Order yours now. Rhythmic beat patterns in various styles. Trending at $124.54eBay determines this price through a machine learned model of the product's sale prices within the last 90 days. This is an authentic Boss® product, not a cheap Chinese knockoff. Rhythmic beat patterns in various styles. Full Roland/Boss warranty. 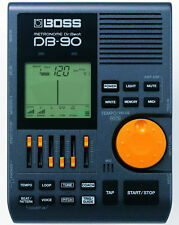 Boss DB90 DB-90 (NEW). Condition is New. Shipped with USPS Priority Mail. Condition is Used and may show wear. Battery included in the sale of this item. Trending at $78.98eBay determines this price through a machine learned model of the product's sale prices within the last 90 days. We strongly suggest that you check your order after receiving it to be sure that it is in proper working order. - Quickly create original patterns with the Note-Mixing function. No APO's or FPO's. Listed 110. Boss Metronome Dr. 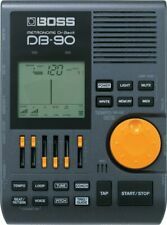 Beat DB-60 Excellent Condition. Condition is Used. Shipped with USPS Priority Mail Small Flat Rate Box. Practicing to a real beat! And check this out, there are inputs for your mic, guitar, bass, or even drum trigger, so you can practice with headphones and never miss a note. Trigger input to access unique Rhythm Coach exercises. Wide variety of rhythm patterns to play along with. BOSS DR. BEAT DRUM MACHINE. AUTHORIZED USA BOSS DEALER . Authorized Dealer - Includes Boss warranty. Guitarists and bassists can directly plug into the DB-90 without any other gear required and monitor via connected headphones. Rhythm coach has 4 training modes to help build your accuracy, speed, and endurance. A wide variety of rhythm patterns to play along with. Quickly create original rhythm patterns with the Note-Mixing function. Excellent. So don't worry about the condition. The new BOSS DB90 Dr Beat is loaded with quality sounds and drum patterns to make your practice sessions less mundane and more musical. Expand your rhythmic horizons with Rhythm Coach. With the DB90's onboard microphone, you can use the Rhythm Coach functions with acoustic drums, or plug a Roland V-Pad into the Trigger input. Expand your rhythmic horizons with Rhythm Coach. With the DB-90's onboard microphone, you can use the Rhythm Coach functions with acoustic drums, or plug a Roland V-Pad into the Trigger input. Play along, and chart your progress. Everyone that buys from us will receive a review within a week. Smoke and pet free house. The new DB-90 is loaded with quality sounds and drum patterns to make your practice sessions less mundane and more musical. The DB-90 is also equipped with realistic PCM drum patterns, for developing your accuracy and rhythmic feel effectively.Expand your rhythmic horizons with Rhythm Coach. The Take-Along Dr. Beat! The DB-30 adds value with its smooth-flowing LCD needle for visual tempo assistance, and two bright LED lights that visually assist your practice. 24 beat variations with complex beats, and 9 rhythm patterns. Don’t worry, we’ll resolve it! Have an issue with your item?. 24 beat variations with complex beats, and 9 rhythm patterns. 12 internal chromatic reference tones. 24 beat variations with complex beats, and 9 rhythm patterns. TOLL FREE INFO LINE! 12 internal chromatic reference tones. BOSS Audio. Noise Cancelling Headphones. 24 beat variations with complex beats, and 9 rhythm patterns. Electro Voice. BOSS DB-30 Dr. Beat. Magma Bags. Latin Percussion. Kala Ukuleles. Tempo: 30-250. Flip out stand on back of unit. Beats: 23 kinds. Reference tone range: C4-B4. Details about BOSS Dr. 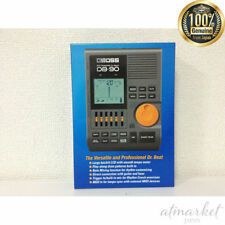 Beat Digital Metronome DB-60. Condition is Used. Shipped with USPS First Class Package.